For someone who loves technology, what better job could there be than covering Silicon Valley and the innovators who keep creating new products and services? I grew up taking photos with a Brownie Instamatic. I learned how to process black & white film. Now I use a high-end Canon DSLR, and I travel the world to take photos that I "process" in digital imaging software. I wrote term papers on a typewriter in school. Later, I built a "hacker special" a PC assembled from components I bought as they went on sale at the electronics store. It's great to know first-hand about what's inside the devices and software that we use. News has been in my blood since I wrote for my high school newspaper. On second thought, maybe it was the ink that rubbed off on my hands that hooked me when I was a newspaper delivery boy. A neighbor, who produced a weekly public affairs show, put me on TV at age five. Being in front of the studio cameras for eight years got me thinking of a TV news career. The dream came true. I'm celebrating my 40th anniversary this year at ABC7. Along the way, I've been on stage at Radio City Music Hall (without the Rockettes) for the Daytime Emmy Awards when I was national chairman of The National Academy of Television Arts & Sciences. I've been inducted into two halls of fame (high school and college journalism school), and I've received two lifetime achievement awards (Asian American Journalists Association and the City & County of San Francisco). There are four Emmy statuettes, too. And when I'm not covering news, you can find me either in the kitchen experimenting or on the road in search of great food. If you have a story idea for me, or risky recipe I must try, connect with me on Facebook. And what kind of tech reporter would I be without a Twitter account? Follow me! 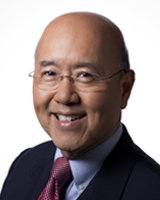 David Louie has been a reporter for ABC7 News for 43 years. He reports on technology and business around the Bay Area. Here's a look inside the brand new sports facility that just opened on the San Jose State campus. A trend in Silicon Valley and around the nation has more and more, houses-- especially larger ones-- being purchased to be shared by a multi-generational family. The reason? Finances.